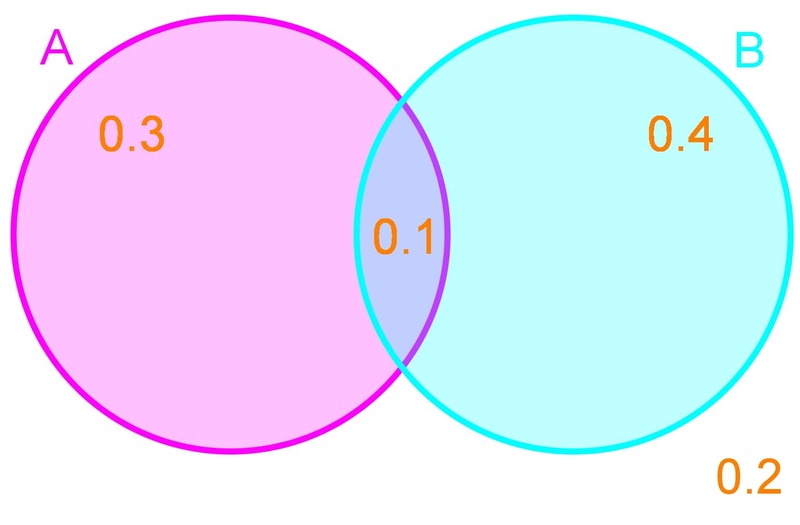 How do we calculate probability with Venn Diagrams? So there are 35 students who are taking only PE classes, 30 students who are taking only Band classes, and 20 students who are taking both PE and Band classes. There are also 15 students who are not enrolled in PE or Band classes. 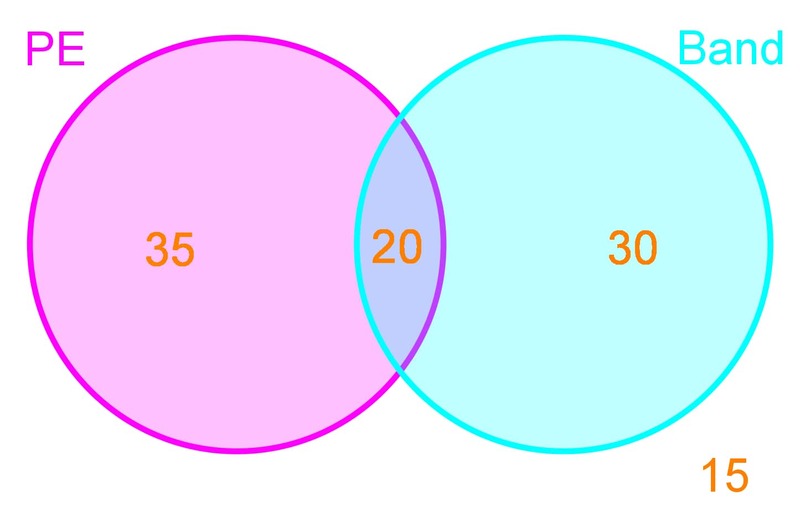 Replicate this Venn diagram in terms of probabilities of picking a random student from any of these classes. What is the probability of picking a student who is in PE class? How many students attend only Band Practice, what is the probability of picking a student who attends only Band Practice? How many students attend Soccer Practice AND Band Practice, what is the probability of picking these students? How many students attend Soccer Practice AND Band Practice AND Track Practice, what is the probability of picking these students? How many students attend Track Practice OR Soccer Practice, what is the probability of picking these students? 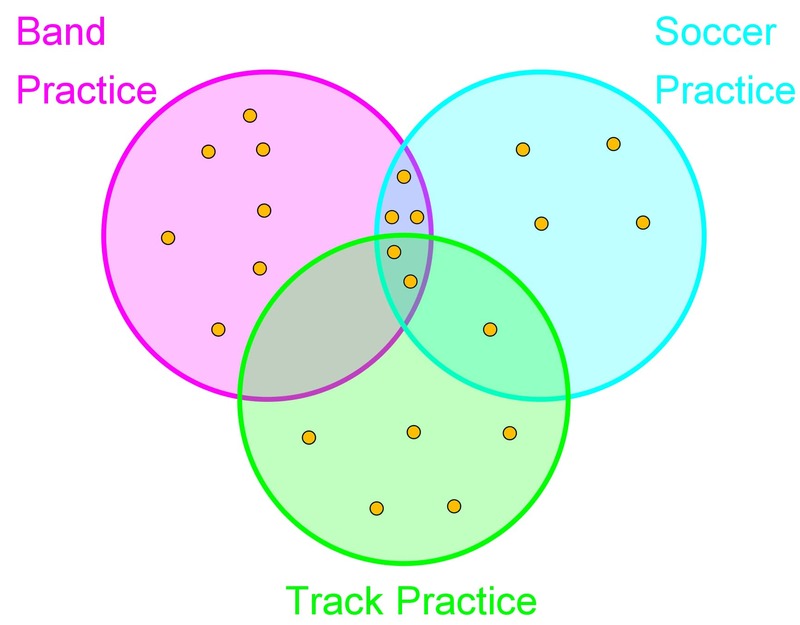 How many students attend Band Practice OR Soccer Practice, but not Track Practice? What is the probability of picking these students? From a deck of cards 10 cards are drawn at random. From these 10 cards the probability of picking a king is 0.3 and the probability of picking a heart is 0.5. The probability of picking a card that is both a king and a heart (the king of hearts) is 0.1. What is the probability of picking a king that isn&apos;t a heart? What is the probability of picking a heart that isn&apos;t a king? What is the probability of picking a king OR a heart? What is the probability of A occurring? What is the probability of A NOT occurring? What is the probability of A occurring or B occurring? What is the probability of neither A nor B occurring?